The type of digger that you will need for a construction project will depend on various factors. Usually a digger is required when the amount of man-hours required to dig the necessary hole is excessive. The size of digger you need will clearly be dependent on the nature of the job and equally importantly what size access to the site is available and how smooth or not the land is. Diggers and mini diggers are often described in a more technical way as excavators. Each size of digger excavator then has its own categories and they in turn have sub-categories. Compact excavators or mini diggers are generally between two and six tonnes in weight and are more powerful than is at first obvious. This more modern versions come with advanced hydraulic systems (Hydraulic Oil) to increase their strength. Another of their valuable features is their adaptability and mobility in comparison to their larger counterparts. Most models of mini digger excavator can rotate around 360 degrees (Gear / Axle Oils and Transmission Fluid & Oils) allowing maximum freedom for the operator. The engine size (Engine oil) and mobility of mini diggers also means they are ideal for smaller sites, those with limited access and where you often have to work in a tight space. Mini diggers are ideal for jobs such as digging ditches, pools or ponds as well as digging trenching for pipes and cables, digging foundations for extensions and general landscaping jobs. Midlands Lubricants supply own brand equivalent Oils and lubricants which are suitable and used on highly regarded brand names include JCB Excavators, Komatsu Digger, Caterpillar Excavator, Hitachi Digger, Volvo Excavator and Kubota Excavator. Many of the larger categories of excavator perform the same roles as their more compact excavators but on a much larger scale and where the access has far less restrictions. Also manufactured are specialised larger diggers and long reach excavators. 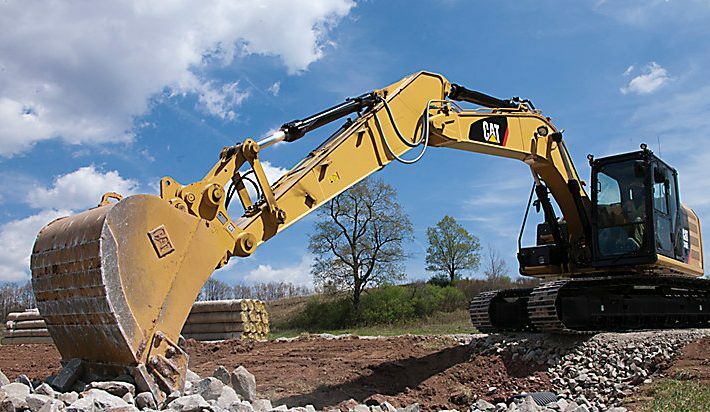 Other larger excavators are used for work such as road building, road maintenance and larger construction jobs. Diggers and Excavators are often equipped with a hammer, a shovel or various other accessories. Midlands Lubricants also supply as well as Hydraulic Oil a wide range of Excavator EP2 Greases, Excavator Traffic Film Remover, Excavator Screenwash Solution and Excavator Antifreeze ideally suited for other types of digger or excavator. We also supply dredger excavators oil, trench digger oil and foundation excavator oil. We also supply Excavator Hydraulic Oil and various other lubricants to the largest monsters in the field are often known as dragline excavator oil and bucket wheel excavator oil these beasts are often used for larger construction projects, civil engineering and mining. The dragline excavator operates using a large bucket by a system of ropes, cables and chains. Bucket wheel excavators consist of a large wheel with bucket and scoop attachments designed to collect earth and deliver it usually to some kind of conveyor belt or grader. Diggers are familiar sights to see on building sites all over the UK and are integral to all types of construction. There are many different types of digger; in this article we will look at a selection of commonly-used vehicles. An excavator is a type of digger that has one arm at the front which consists of a boom and a stick, and there is a bucket right at the end. The cab sits on top of a revolving platform and there are wheels or tracks beneath for movement. These types of diggers are used for a range of projects such as landscaping, digging, demolition and grading. They can range in size quite considerably, with large examples of excavators often being utilised by the mining industry and small examples of these diggers are used where space is at a premium or access is restricted. Some can even squeeze through doorways. This type of digger was invented in 1953 in the UK by JC Bamford, founder of J.C. Bamford Excavators Limited. It is commonly known by the JCB initials but it is basically a tractor body with an attached front bucket and backhoe. A Backhoe Loader is both compact and versatile, with the front bucket being used for loading hence the name Loader and the ‘backhoe’ for digging and moving soil etc. The big advantage for these diggers is that they can be driven along roads on licence as well as on site, making transfer between jobs at different sites relatively straightforward and inexpensive when compared with a digger that must be loaded onto another vehicle or even dismantled before transportation can take place. The backhoe loader also gains extra stability while digging by having its hydraulic stabilisers Backhoe Loader Hydraulic Oil and front scoop lowered, allowing the vehicle to exert considerable force and dig quickly. The bulldozer actually developed from the farm tractor and was in common usage in America by the 1920s. These diggers are generally used for construction and demolition as well as mining and road building. Bulldozers have huge steel blades which are front-mounted and these are pushed along by the tractor type body which is mounted on top of caterpillar tracks. They are extremely versatile and have different blades for completing different tasks and can be fitted with rear ripper attachments to break through hard surfaces. These vehicles are able to navigate very rough terrain with ease as they have very wide tracks, a bit like a military tank (Ancillary, Light Vehicle, Jeeps, British Military, US Army Oil and Lubrication). Loadalls (Loadall Hydraulic Oil) are also known as telescopic handlers (Telescopic Universal Oil range) and were first introduced by JCB (JCB suitable Digger Oil) in 1978. These diggers are commonly used in both agriculture and construction and are compact and versatile. They have excellent features such as pivoting, extendable arms or booms with a forklift attachments as well as shovel, bale lift and grapple attachments can also be used.